A coffee can transformed into a functional work of art? Seeing is believing when one applies these instructions to create a grocery bag holder out of a tin can. Classy with a vintage vibe, a decoupage accessory for the kitchen is the final result of this project. With all the DIY tin can upcycle instructions available, it may feel overwhelming to choose a craft project without knowing the end result. If these instructions are followed properly, the tin can from step 1 certainly will look nothing like the tin can at the end of the craft project. Not only does this piece look lovely on a countertop, but it also serves a functional purpose to hide loose grocery bags. 1. Remove the lid from the coffee can. 2. Lay the can on its side on scrap paper. 3. Fill a small glass bowl with light blue chalk paint. 4. Dip a paint brush in the paint and proceed to paint all sides of the can. Set the can to the side to dry. 5. Place the lid on a cutting mat. 2. Use a black permanent marker to draw a diamond shape on the center of the lid. 3. Use the utility knife to cut the diamond shape out of the lid, then place the lid on scrap paper. 4. Fill a small white bowl with white acrylic paint. 5. Dip a paint brush in the paint and proceed to paint the top and sides of the lid. 6. Squeeze Modge Podge into a small glass bowl. 7. Dip a paint brush into the Modge Podge and cover the lid with the sealer. 8. 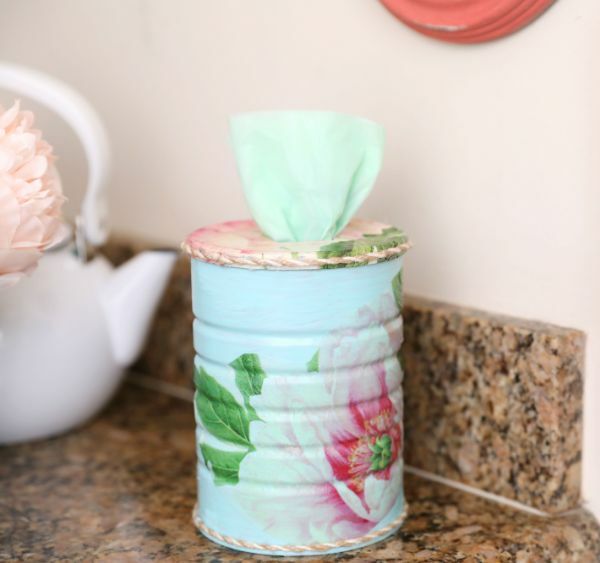 Place a sheet of floral decoupage paper over the top of the lid, then smooth it down and brush more Modge Podge over the surface of the paper. 9. 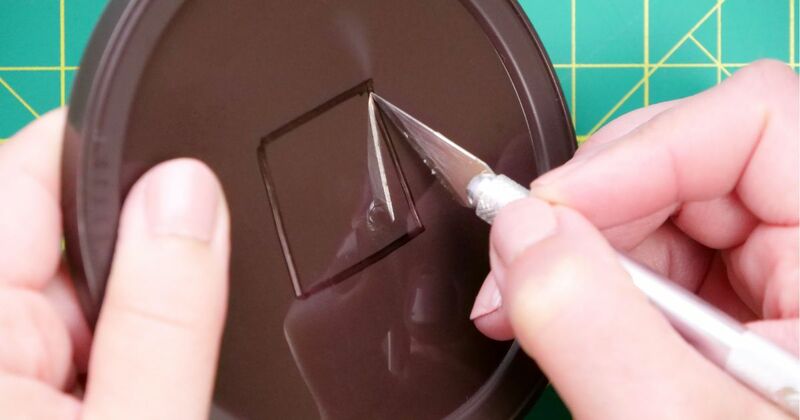 Use the utility knife to cut away decoupage paper from the diamond shape in the center of the lid. The diamond shaped hole must be visible and accessible. 10. Flip the lid over and use scissors to trim excess paper. 11. Apply Modge Podge to the inside of the lid and all around the rim to secure the ends of paper. 11. Use scissors to cut a few floral designs out of sheets of decoupage paper. Depending on the size of the flowers, you may need between 2 to 4 floral designs to cover the sides of the can. 12. Place the can on scrap paper, then arrange the floral designs cut in step 11 on the surface of the can. Plan an idea of how to arrange the floral designs, and cut as necessary to ensure a good fit on the can. 13. Dip a paint brush in Modge Podge and brush it on the surface of the can for application of the floral design. 14. Adhere the floral design to the can, then continue to brush and stick additional floral cutouts to the can, using caution not to overlap paper. 15. Brush Modge Podge over the surface of the paper and can to seal. 16. Put a glue stick in the hot-glue gun and prepare the glue gun for use. 17. Squeeze glue around the base of the can, just above the bottom rim. 18. Wrap twine around the can, adhering it to the glue above the bottom rim. 19. Use scissors to cut excess twine. 20. Squeeze hot glue around the sides of the lid. 21. Apply twine to the glue so that it covers the circumference of the lid. 22. Cut excess twine with scissors. 23. Place a plastic grocery bag in the can, then place the lid on the can. 24. Pull the grocery bag through the cut in the lid so that it is exposed and easy to grab.